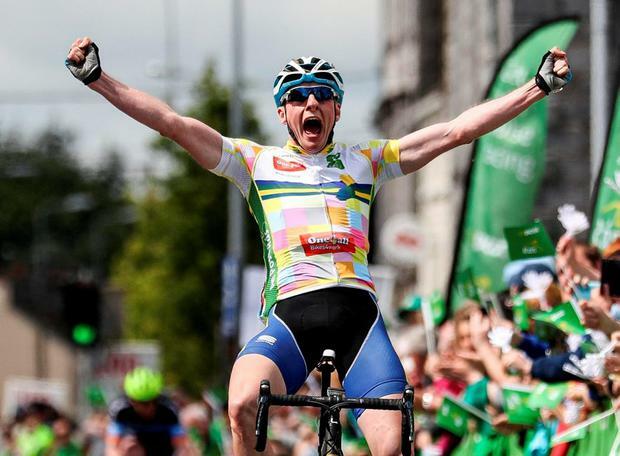 Thirty-seven years after his father Peter won a stage of the Ras into nearby Mallow, Dublin teacher Eoin Morton put in the ride of his life to outsmart the professionals and take victory on stage two in Charleville yesterday. Having taken the only King of the Mountains points on offer on day one, Morton, riding for the Dublin UCD team, was active again yesterday, eventually escaping the clutches of the peloton with Bryan McCrystal of Louth Asea midway through the 184km stage. With just two riders out front, race leader Taco van der Hoorn admitted he underestimated the strength of the amateur duo and the lead soon grew to seven minutes. "When the two guys went away, we thought, yeah, it's only two guys," said the Dutchman. "But they got seven minutes really quickly so it was very difficult to bring them back." With McCrystal needing just 23 seconds advantage at the finish to take over the race lead, a last gasp chase from the professionals saw the duo enter the finishing straight within sight of the peloton. In the sprint, Morton showed a clean pair of wheels to his breakaway colleague and took a fantastic stage victory, with the gallant McCrystal second, just seven seconds clear of the marauding peloton. Having achieved every domestic rider's dream of a Ras stage win, Morton was visibly moved. "I've no words to describe this," said the amateur from Swords. "I can't believe it. We're always billed as the underdogs here, which we are, I suppose. "When this race finishes on Sunday, I've to go to work on Monday morning, go teach some kids. . . I'm going to well up and cry. "I looked at the road book last night and knew it was an uphill finish. I knew whoever was first around that last corner was going to win, and first around that corner was me. I think I broke a few windows around here when I screamed going across the line. "I feel really bad for Brian though. I thought he was going to take the yellow jersey but he missed it by a few seconds so I'm really disappointed for him." Van der Hoorn seemed as surprised as anyone to hold onto his yellow jersey and still leads the race by six seconds from Kiwi Kennett Dylan. "I didn't even know I still had the jersey," he admitted. "I was already on the way to my hotel. Tomorrow is really hard though, so I don't think I will keep it for much longer."